Motor coach tours in Edinburgh with SMT. Homepage. This page: A leaflet describing the day tours offered by the SMT coach operator in Scotland. 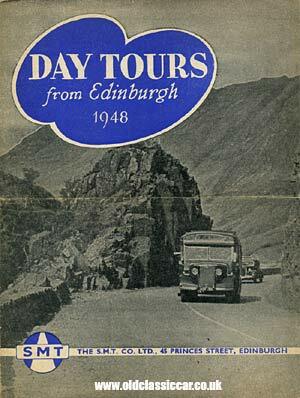 This smart leaflet was issued by SMT, or Scottish Motor Traction to give it its full title, in February 1948, and describes the various day trips that were available around the Edinburgh area of Scotland. The firm was based at 45 Princes Street in the city. The cover shows a 1930s or 1940s coach grinding up a craggy pass somewhere in Scotland. A close look at the image reveals that the coach driver is planning to turn right - note the raised semaphore (trafficator) to the offside of the coach - hopefully into a pull-in where the photographer is stood, rather than down the ravine. 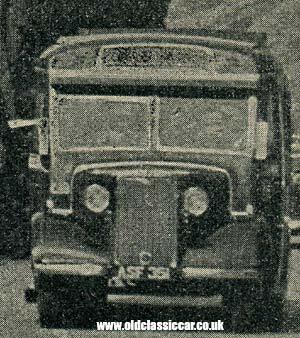 Does anyone recognise the vehicle make, model or the coachwork on this vehicle? Registration number ASF 351, an Edinburgh number as you'd expect. The leaflet folds out and lists the various day trips on offer, all of which departed Edinburgh from St. Andrew Square. The destinations included Oban, Stranraer, Glencoe, Pitlochry, Loch Lomond, Sweetheart Abbey, Gretna Green, Berwick, and Devil's Beef Tub to name just a few. They also operated a number of sightseeing excursions around Edinburgh itself. SMT was born in 1905 operating buses throughout central Scotland. In addition to this, it seems they also briefly operated an air taxi during 1932, using a DH Fox Moth for this service. The year after this leaflet was produced, in 1949, the company was nationalised, but continued to operate under the SMT name as before. Over time, SMT absorbed other smaller bus companies, and was itself absorbed into much larger combines. By the mid 1980s it was part of the Scottish Transport Group, and at de-regulation in 1985 the STG was split into several, new, operating companies. Return to the motoring collectables section, for more car, lorry and bus ephemera.